and revive. As a Guest at Almar Resort Luxury LGBT Beach Front Experience , you have free access to our Mantamar Beach Club. 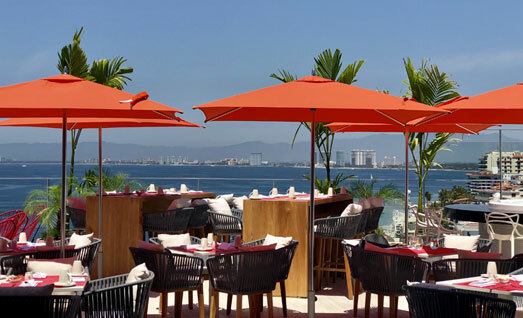 Begin your day with a savory breakfast while admiring the landscape of Banderas Bay from The Top Sky Bar. Bask in the sun in a comfy lounge chair, then indulge in the hot tubs while listening to a live DJ and sipping gourmet cocktails from the bar. At twilight, the party turns up with our new Sunset Shows and breathtaking sunsets. 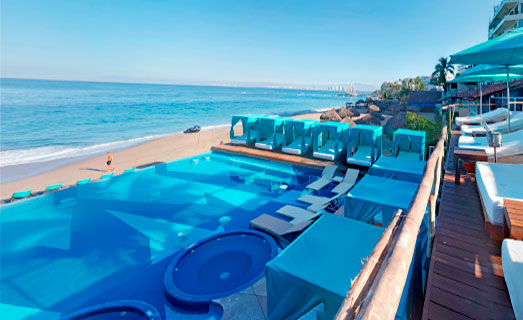 Enjoy the pleasures Puerto Vallarta in an exclusive sky bar. Life is better at The Top! 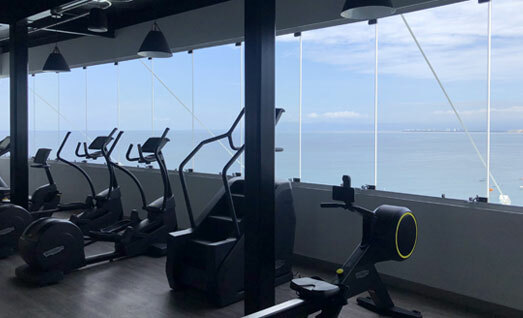 Our trendy ocean-view gym is for people who want to be seen. Enjoy your gaycation with a sweat sesh in our state-of-the-art facilities. We’re outfitted with ARKE functional training equipment for core stability and mobility, so you can get the most out of your time in the gym and sculpt your body as you wish. Dedicate time on your health and fitness before heading out to the sand to attract glances from the sexiest guys on the most famous gay beach in Puerto Vallarta. Open from 6am to 10pm and free for guests. Personal Training available at an additional cost. Wind down your evening in style while tasting a delicious gourmet menu. 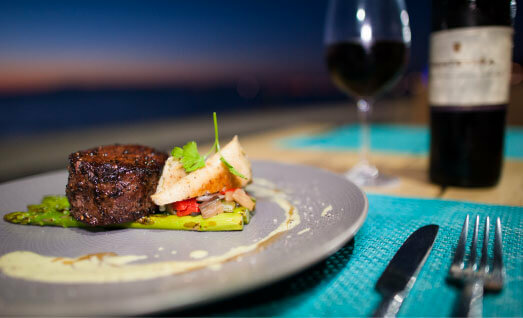 Mantamar Beach Club, our signature eatery, serves fresh international dining in a relaxed but elegant atmosphere. This exclusive beach club offers a casual gourmet menu focused on fresh regional products to create an extraordinary Pacific-Mediterranean dining concept. Mantamar Beach Club Restaurant is ready to provide guests an excellent culinary experience, even to the most distinguished palate. Now with a Sushi Station and new and delicious snacks in the lounge area, your gastronomical experience will be more complete. Indulge yourself with a relaxing massage in your room. Let the sound of the sea waves take you to a state of peace and serenity. Enjoy this experience alone or accompanied with an extra charge. diving, surf,paddle , boogie, kayaking, volleyball, massages on the beach, ping pong, board games, hiking and beach walking. suites in the heart of Puerto Vallarta. They offer spacious interiors, spectacular terraces and spectacular ocean views. Every bathroom offers luxurious amenities that will exceed your expectactions.